Microsoft Azure team is committed to helping you achieve more with the power of the cloud. The Azure support teams are here to help you build, deploy and run your Azure solutions with confidence. We are continuously expanding troubleshooting and support areas to help you accelerate your cloud journey. 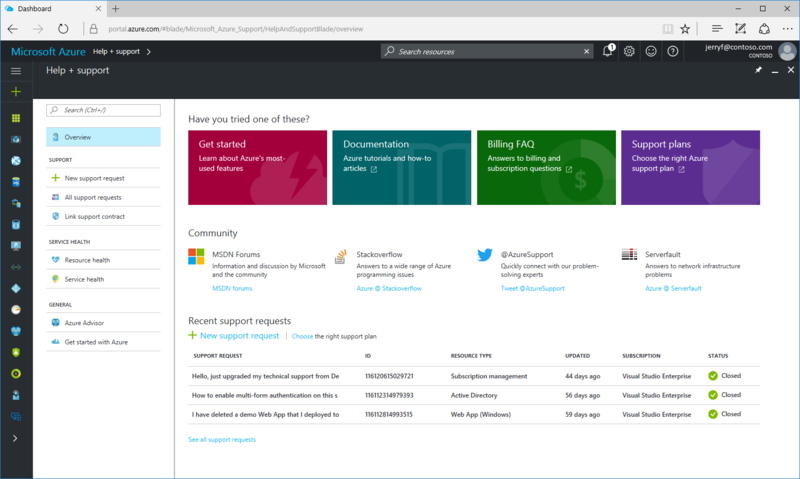 This post provides an overview of key self-help tools and a quick glance at Azure support. Comprehensive documentation and get started resources are a good start for all Azure customers. As you begin to design your solutions and look for help from community experts – Azure Forums is a great option. While you progress building your solution, self-help and optimization tools are built into the Azure Portal. Can’t connect to your VM? Just click on the Diagnose and solve problems to follow troubleshooting guidance for resolution right in your Azure Portal. This troubleshooting solution is included with all Azure services. Once your solutions are established, Azure Advisor preview provides personalized recommendations based on best practices to further optimize your environment for e.g. high availability, or security. Azure Advisor is a recommendation engine that provides proactive, actionable, and personalized best practices to help you improve the high availability, security, performance, and cost effectiveness of your Azure resources. Check the Advisor dashboard to get your list of recommendations. These are some of resources and tools that you can utilize on your own. If you need in-depth help and assistance for your mission critical applications, the right Azure technical support plan can help you. Microsoft Azure offers flexible support options that give you direct access to Microsoft technical engineers. You will receive the best available expertise aligned to the level you need, allowing you to focus on your business outcomes. Microsoft Azure support plans are designed to help everyone – from individual developers to multi-national organizations, covering range of environments from trial to business critical. Premier support, the top tier plan, is ideal for large and global customers who need comprehensive support across multiple Microsoft products, including Azure. If you are looking for non-technical subscription and billing support for Azure, it is included with every Azure subscription and can be accessed from the Help + support blade in your Azure portal. Please let us know your comments and ideas about Azure support and troubleshooting as it will help us continue to evolve these areas. Submit your feedback on Azure portal or via @AzureSupport on Twitter, where you can also get answers from Microsoft Azure experts. To ensure your Microsoft Azure support plan is aligned with your business requirements, visit the Azure support page. Having access to the right support and resources is an investment that can help you get the most of your cloud assets can save you money, and can make your organization more productive.